WINDOW JAMMERS®! Innovative, Award-Winning, Interactive Car Toy! Shop now for Parents' Choice Award® winning creative play toys, window Jammers®! Window Jammers™ help kids turn a ride in a car, long or short, or a ride on a bus or train or even just looking out the front window, into an action-packed journey through any landscape. — Melanie Morgan. Teacher. Mother. — Teresa M. Retired Police Officer. Mother. — John Ruben. Engineer. Father. Window Jammers™ are a low-tech, highly engaging car toy for hours of imagination-fueled entertainment using the real world! What child (or adult) has not stared out the window of a car or train or a bus and daydreamed of a spaceship or motorcycle or a pixie fairy cruising along the horizon, leaping over pitched roofs and hills? Window Jammers™ start with a sturdy plastic card featuring a colorful character printed on both sides. The card, or "Jammer," sticks on the end of a telescoping "Jammer Stick" with a powerful suction cup. Players move the Jammer around on the window driving on, flying over, or smashing through the passing landscape and obstacles. Dozens of the coolest, most imaginative Jammers ever are in the works so STAY TUNED! Collect your favorite Jammer characters to use over and over again, or to trade with your friends! Jammers and all their crazy flying, jumping, flipping, speeding stunts are only limited by your imagination! Follow the Window Jammer™ YouTube channel to see Window Jammers™ in action! Window Jammers® are simple enough that even 3-year-olds can pick it up within seconds! And with a little practice, anyone can be performing unbelievable stunts across the landscape. Any landscape! Simply sit it, stick it, and jam it! 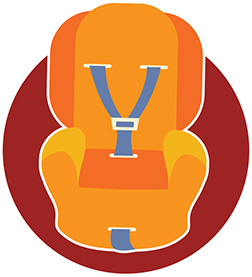 Sit down in your carseat, booster seat, automobile seat, train or bus seat and be SURE to buckle up for safety! Select the Window Jammer™ character of your choice from the included soft storage bag. Store your character bag in a safe place where it won't fall on the floor or fall out of the vehicle when the door opens. Stick the character of your choice on the Jammer Handle by pressing the suction cup firmly on to the character. Note that depending on what side of the vehicle you are sitting the character can be flipped to face left or right. If more suction is required moisten the suction cup slightly. Each character comes with a safety tether, to make sure that the character cannot fly off if it becomes dislodged from the suction cup. If you choose to use the string tether, loop it through the tether hole on each character and then around the Jammer Handle as shown. Keep all unused string tethers not already connected to characters in the soft storage bag for safekeeping. Press the Jammer flat against the inside of a CLOSED window and puppet the character over the passing landscape! Twist the handle at any angle to cause the Jammer to rotate for flips, jumps and rolls! Window Jammers™ are designed to be used in the inside surfaces of see-through windows in moving vehicles or on stationary TV or computer screens. They are NOT designed to be used through OPEN windows of moving vehicles, as the characters will blow off and potentially become lost, and the wind may blow the Jammer in a way to cause injury. NEVER USE THROUGH OPEN WINDOWS! To use, extend the Jammer Stick by pulling on the smallest diameter tube and extend the telescoping Jammer to a comfortable length. To prevent the Jammer from being dropped, use the attached Wrist Strap to secure it to the wrist. NEVER REACH FROM A DRIVING POSITION IN A MOVING VEHICLE TO RETRIEVE A DROPPED WINDOW JAMMER OR ADJUST IT IN ANYWAY. PLEASE STOP IN A SAFE PLACE BEFORE ASSISTING WITH ANY PASSENGER! Press the Jammer character against the window and imagine it moving along the background landscape. Twist it and turn it to perform stunts, jumps and flips! Be sure and collect all the characters to maximize the fun and imaginative capacity of Window Jammers™! After play, collapse the Jammer Stick back into the Handle. Remove the character and store it in the soft storage bag for safe keeping. Keep the Jammer handy to pull out at once for instant fun and enjoyment! Flambi Toys™ is an innovative company founded by these two guys, with a mission to create proprietary, engaging and imaginative toys. Original, physical, touch-'em, feel-'em, get-outside-and-look-around toys. Flambi Products™ creator, Kory Fluckiger, is a daddy, fine artist, illustrator, game designer, poet and inventor. He believes that anyone who pretends that toys are only for small children is wasting a lot of time hiding someplace and keeping all of their 'explode-y' sound effects to themselves. Kory lives by the motto: "If I am unable to be that which I am not, I will never be more than I am." So he is always looking for a challenge. He has over 20 years of experience in Arts and Entertainment and has been creating toys since he was tiny. Now he is combining all of that into making toys that spark imagination in others. Timmy is a classic outside-the-box guy, serial entrepreneur, visionary, all-around rule breaker, a daddy as well, and surprisingly has also been the managing partner of the business development firm Spectra Consulting Group for over 25 years. He has his hands in numerous ventures as an investor, company officer, lead whiner, consultant, CEO and cheerleader. His entirely boring bio is available here. Timmy loves being a part of the discovery of simple, paradigm-shifting ideas and products, and loves using his creativity and resourcefulness to bring them to market. When not furiously developing unique ventures, Timmy is off playing in the water, snow or outdoors, at home or somewhere around the world. Matt is a big kid at heart with a passion for inventing and developing toys and unique consumer products. He has worked with startups for over a decade helping developing products, establishing businesses, and managing legal and IP matters. His ability to solve difficult problems is only thwarted by his desire to play with kids' toys all day. Matt enjoys golfing, fly fishing, and creating games to play with his kids.. As an engineer and an attorney, every week he claims to have a million dollar product and licensing idea...time will tell. Regardless, Matt is a straight shooter with an entrepreneurial spirit. If you want to see Mike’s impressive yet less fun professional bio, you can check out his LinkedIn page, but he is so much more than that. As an actor, comedian, world traveler, average yet competitive athlete, favorite ‘f’uncle, with a never grow up mentality, he fits the Flambi Toys team perfectly. He has 10 plus years in marketing where he strove to achieve all goals and objectives while having fun doing it. Creating fun moments and experiences is what he lives for. So marketing toys that spark imagination and entertain couldn’t make him happier.